26, Jan, 2009. Today is Chinese New Year, the year of OX. 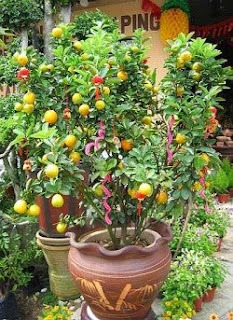 Aside from the couplets and red cloths, beautifully carved OX statue, plants are also one of the things to add some festive spirit to the Chinese New Year, you may parallel this auspicious plants as Christmas tree in western countries. Chinese name for lime is "Kat Chai" in Cantonese or same sound as another auspicious word "ji" in many other Chinese dialects. Lucky bamboo has been loved by Chinese for its upright and empty heart, which is symbolized as humble and moderate, and since the words for "bamboo" and "prayer" sound alike in Chinese, it's for the best wishes of prosperity. 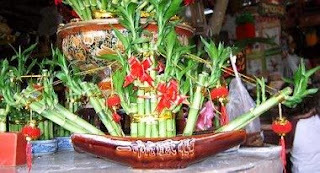 The words on the boat-like vase reads ‘Yi Fan Feng Shun’ which means ‘smooth sailing’.